So, I've thought of using glue to stick pieces of cardboard together into a sword and then putting aluminum foil on it and painting it to look like it has rusted. Turns out, for paint to stick to aluminum you need to make sure there is no aluminum oxide and treat the aluminum. Paint won't stick to bare aluminum but acrylic paint is the best type of paint to use on aluminum. Is there any inexpensive metal foil for which I could just paint it on and not have to worry about treating the metal? So you can see, there are some areas where I would be using black paint and others where I would be using orange paint and I think I might want to like do a whole layer of black paint and then after drying, put the orange paint on in another layer. But I don't want to go through the expensive process of getting rid of the aluminum oxide and treating the aluminum so is there an inexpensive metal foil that paint will actually stick to without treating the metal? Do you mean paint won’t stick to aluminum foil? Because any two-component epoxy based paint will stick to aluminum and aluminum foil. But I think your approach is flawed from the get go. You should look into the way cosplayers build swords. They have a skeleton-like frame (sometimes a solid wood dowel) underneath the sheathing which is very often a type of foam matt like you would find at a camping store for underneath a sleeping bag or a type like that which is used for yoga. They cut shapes and glue them together, perhaps even screwing them to the dowel, paint them, apply decals from model kits etc. The videos can be quite entertaining. You can buy steel foil (US, UK examples) then paint your rust onto that. If you can get one that's not stainless (they exist) you can make it rust. 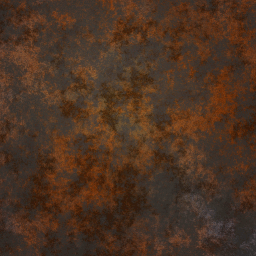 Even stainless can be rust-stained in wet contact with mild steel (food cans, steel wool). Self-adhesive versions (steel foil tapes) exist too. Otherwise I'd paint the blade using metallic paint, before applying the rust-effect paint job. To continue with your current design, without changing the materials used for the original construction, I would recommend finding a suitable spray paint. Some spray paints are specifically designed to stick to metal surfaces, and you could find one of these in a color and sheen suitable to your project (dark brown, or black, with whatever level of shine you desire). You should be able to paint with acrylics on top of a spray painted surface without too much trouble. I suggest using a natural sea sponge to create the rust effect. The natural shape of the sponge will help keep the rust from looking too manufactured. You can find spray paint at a wide range of home improvement and craft stores. A quick search on the Home Depot's website turns up many options under $5, so the solution you are looking for should be fairly inexpensive. Not the answer you're looking for? Browse other questions tagged paint technique-identification metal or ask your own question.